The way you grind your coffee (and when you grind) is the first step toward influencing how the final brew tastes. Believe it or not, you can have the highest quality coffee, the perfect roast, pure water, premium filters, and an excellent coffee maker and still ruin it all with an incorrect grind. But don't let your woes stop you; some basic knowledge about coffee grinding will go a long way toward helping you make that perfect brew. Regardless of your coffee brewing method, the basic goal of grinding coffee is the same: Break down the roasted coffee bean to expose the interior of the bean allow the right amount of oils and flavors to be extracted. Ground coffee has much more surface area than whole bean coffee, allowing water (the extraction agent) to make contact with more coffee when brewing. More contact means more flavor extraction and better yield. Most inexpensive (under $30 or so) grinders use a sharp metal blade to literally chop up your coffee beans. As the blade spins, the coffee beans are chopped. You control the fineness of the grind by "pulsing" the power button until you're satisfied. It can be difficult to judge how much coffee to grind, and how finely to grind it, however. Another downfall – if you are grinding finely, and therefore leaving the beans in the grinder longer, there can be significant heat created by the blades. This can give your final coffee a burned taste and destroy other flavors. Blade grinders are fine for basic use, but that's about it. Burr grinders crush the beans between a moving grinding wheel and a non-moving surface. Typically, the burr position can be adjusted to regulate the grind size. Because burr grinders grind a few beans at a time, in sequence, they provide a much more even and consistent grind. In the burr category, there are two different types. Wheel Burr - The less expensive of the two burr grinders. The higher rotation speed of the wheel can make these grinders a little more messy and noisy, however. Conical Burr - These are the best grinders money can buy. The burr spins slower than the wheel model, which makes them quieter and less messy. Also, conical grinders are less likely to clog when grinding oily or flavored coffee. Conical burr grinders are more expensive, but definitely worth the extra cash. The ideal fineness (or coarseness) of your ground coffee depends mainly on what type of brewing method you are going to use. In general, if you brew coffee that is ground too coarse, the coffee can be under-extracted (weak), and less flavorful. 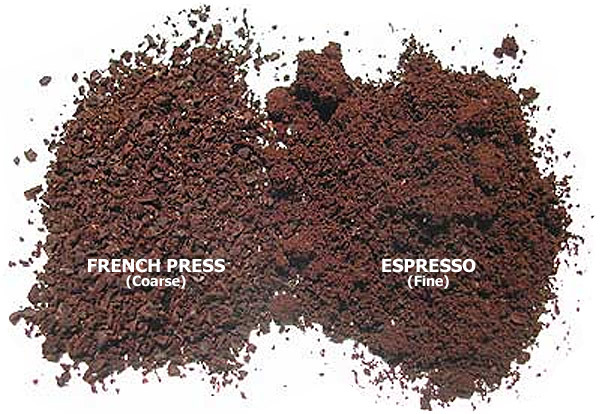 If your coffee is ground too fine, however, the coffee can be over-extracted and bitter. Small changes in grind size can drastically affect the taste of your final brew. Coarse: Distinct, chunky, pieces of coffee beans. Like heavy kosher salt. Medium: Gritty texture with visible flakes. Like very coarse sand. Fine: Much smoother texture. Like table salt, maybe a little finer. Extra Fine: Coffee grains still barely discernable. Finer than granular sugar. Turkish: Powdered with no grains. Blade grinders cannot grind this fine. Like flour. Copyright © 2005–2016. Coffee Tea Warehouse. All Rights Reserved.